Airlines need to “keep schedule” to be commercially viable. That is, they need to fly to and from pre-set destinations on a consistent basis. But changing weather makes this challenging. Flights can be disrupted by a wide range of atmospheric conditions, including fog, cloudbanks, storms, turbulence, icing conditions, and headwinds. Over the course of the twentieth century, people involved with aviation devised ways deal with changing weather conditions. One strategy was to overcome weather by creating sturdier aircraft, new instruments, and so-called “all-weather” flying systems that allowed pilots to navigate and land in a much wider range of weather conditions (Morrison 2003; Conway 2006). A second strategy involved trying to better understand, monitor, and predict the weather. Airlines hired weather forecasters to brief pilots and route aircraft in ways that minimized exposure to hazardous conditions (Turner 2010). To improve those forecasts, airlines sometimes created networks of weather observers. More often, they leaned on national governments that already ran weather services to measure different aspects of the atmosphere and disseminate those observations (Thomas 1996; Walker 2012; Henry 2017). Meteorologists also wrote training manuals and taught pilots how to apply meteorology in flight. Collectively, these advances transformed aviation into an infrastructure, a transportation system safe and reliable enough that many have come to depend upon it to move people and goods around the world. This module explores the symbiotic development of meteorological labor and commercial aviation from the 1920s into the jet age. Meteorology changed as the development of aviation became a priority for governments of many nations. When the Wright brothers asked about a place with strong, steady winds for their flight experiments, the US Weather Bureau recommended Kitty Hawk, North Carolina. But as airplanes and airships became more capable, particularly during World War I, aviators recognized how different conditions aloft could be from those measured at the ground. Aviators’ needs began to outstrip the meteorological theories that guided the work of government weather services around the world. Twentieth-century meteorologists increasingly studied the physics of the free atmosphere—the behavior and structure of the atmosphere that moves largely free from the frictional effects of the ground – rather than the weather that we experience on the ground. Pioneering this effort was a group of Scandinavian physicists who developing new methods for understanding the behavior of the atmosphere in three dimensions. Led by Vilhelm Bjerknes, the so-called “Bergen School” (named for its location in Bergen, Norway) sought to improve weather prediction by applying thermodynamics and classical physics. During 1917-1918, they developed the concepts of air masses and storm fronts, inspired by the Great War’s battle maps. Cold, dry Arctic air masses clashed with warm, moist air masses from the tropics along the “polar front,” leading to sloped interfaces that produced distinctive patterns of cloud, precipitation, and flows of air in three dimensions. As these concepts were refined in the 1920s and 1930s, they offered the potential to predict changes in visibility at different altitudes, as well as the location of violent “squall lines” particularly dangerous for dirigible airships. During the 1920s and 1930s, Bergen School methods began to spread around the world, often touted as the foundation of “modern meteorology.” Bergen School students emigrated or spent extended fellowships with national weather services across Europe and North America. The US Navy’s leading aerologist, Francis Reichelderfer, visited Bergen for six months in 1931-32, producing a report that circulated widely, if informally, amongst military meteorologists. (The Navy called its weathermen “aerologists,” because they focused on conditions aloft.) By 1933, the former head of the British Meteorological Office would call the graphic representation of the Bergen School’s model of storm formation in three dimensions “the most widely known illustration of modern meteorology.” It was reproduced in meteorology textbooks and pilot training manuals, thus becoming an icon of the new theory of weather. But the adoption of Bergen School theory and new methods of forecasting was not automatic or easy. A high-level delegation from the British Met Office endorsed the new methods after a visit to Bergen in July 1920, but fronts did not appear in the public Daily Weather Forecast until 1933, in part because analysts across Europe had trouble agreeing on where fronts actually were without better observations of the upper air (Walker 2012: 228). In the Soviet Union, the foreignness of Norwegian methods was part of the accusation that led to the purge and eventual execution of Alexei Wangenheim, the director of the national Hydro-Meteorological Service (Rolin 2017). The civilian Weather Bureau in the United States did not adopt Norwegian methods until the late 1930s, largely due to the difficulty of retraining its forecasting staff and reorganizing their workflows (Whitnah 1961). Figure 1. The Bergen School’s model of storm formation (cyclogenesis), drawn by Jakob Bjerknes. Printed in Sir Napier Shaw, The Drama of Weather (Macmillan, 1933): 246. In 1927, Bjerknes student Carl-Gustav Rossby was recruited to establish a private weather service in California for Western Air Express, which the Daniel Guggenheim Fund for the Promotion of Aeronautics was helping to develop as a model airline. The airline planned to connect Los Angeles and Oakland with three-hour flights using new tri-motored passenger airplanes. Rossby created an areal network, recruiting observers at stations to the east and west of the airway, as well as directly along the flight routes. (To this point, the U.S. Weather Bureau had established aviation weather stations mainly at airports directly along airways.) The observers were given a cloud atlas to better identify cloud forms in a consistent way, which helped the forecasters get a sense of the humidity and visibility conditions aloft. During flying times, observers reported on a set schedule (first spaced an hour and half apart, later every three hours) and could be called upon to make supplemental observations when conditions were expected to change rapidly. Observers were asked to report: the wind direction and intensity (on the Beaufort scale); a one- to three-word description of the air conditions at the ground; the amount of clouds; the cloud forms; the ceiling; the visibility; the temperature; and the atmospheric pressure. When read in code by a disciplined observer, this information could be communicated in about twenty seconds. By the end of the summer of 1928, reports from over thirty-five stations were being gathered and plotted in under an hour. In addition, six pilot balloon stations were eventually established to create a vertical profile of windspeed and direction. All forecasting and analysis of observations was made by Rossby or his handpicked men at the Oakland and Los Angeles terminals. One forecaster was Horace Byers, a University of California, Berkeley undergraduate who soon became Rossby’s indispensable righthand man. The airline mapped out three possible flight routes, choosing which to use based on current weather reports. The pilot received a weather report fifteen minutes before take-off, as well as updates by radio every fifteen minutes while in flight. These reports contained information on ceiling, visibility, and general condition of the sky (cloudy, overcast, broken clouds, clear, etc. ), which was crucial since these planes were flying in visual contact with the ground, at altitudes varying from five hundred feet above ground level up to a few thousand feet. The model weather service was a moderate but somewhat narrow success. WAE suffered no weather-related mishaps during 1928 and 1929. Other US airlines embraced integrating weather observations, forecasting, and keeping pilots informed by radio. Rossby assisted Transcontinental Air Transport as it set up its meteorological service in the fall of 1928; Horace Byers helped expand WAE’s system geographically when he returned in the 1930s to build up a meteorology department at the reorganized airline now named TWA. But areal weather observing networks and pilot balloon stations were expensive to run. The Weather Bureau initially refused to take over the observing network. When the Guggenheim Fund stopped its subsidy in early 1929, the entire system nearly collapsed. Only a last-minute intervention (probably at the behest of incoming President Herbert Hoover, whose son worked for WAE) secured Weather Bureau cooperation. Pictured here is WAE operations staff member and radio specialist Herbert Hoover Jr. Barely legible at left is the location of each observing station. Figure 2. Herbert Hoover Jr. watches the weather for Western Air Express. Photograph by the Associated Press, Los Angeles, March 19, 1929. Print in author’s personal collection. “As much as a pilot fears anything, he fears fog!” exclaimed Ford Motor Company in 1929. But fortunately, “the weather man at Washington” was now “lifting his eyes to the pathways of the sky.” Although the ad visually implied it was the hand of God that guided pilots, the text described how government meteorologists were soon going to provide “guidance to clear flying and safe landing.” This was a wildly exaggerated claim when it was published in 1929. But over the coming decades, government did play a pivotal role in making the skies navigable and known. In the United States, the Department of Commerce largely took responsibility for aviation, developing a system of radio navigation beacons as well as licensing pilots and certifying aircraft designs. The Air Commerce Act of 1926 subsidized the nascent commercial airlines through generous air mail contracts. The Commerce Department, in a series of moves of dubious legality, then pushed airlines into mergers with airplane manufacturers and engine makers, ensuring that the mail would be flown in technologically advanced planes that had extra space for passengers. The Weather Bureau, located since 1891 in the Department of Agriculture, moved with considerably less boldness in supporting aviation. The Weather Bureau (today known as the National Weather Service) maintained a nation-wide network of observing stations, and a centralized staff of forecasters who produced predictions and weather information for the entire nation. The Bureau also coordinated the international exchange of weather data. Since 1870, the Bureau had focused on the weather at ground level, in support of shipping safety, farmers, commodity traders, and the broad public interested in tomorrow’s weather. The Bureau’s most prominent product was the daily synoptic weather map, a snapshot of surface conditions across the country, which forecasters relied upon in predicting the weather. Adjusting the Bureau’s working processes to gather data about conditions aloft was slow, particularly since that new mission was rarely accompanied by adequate new appropriations by Congress. Still, the head of the upper air division was promoted to Chief in 1934, and he was succeeded by the Navy’s flying meteorologist Francis Reichelderfer in 1938. Figure 3. 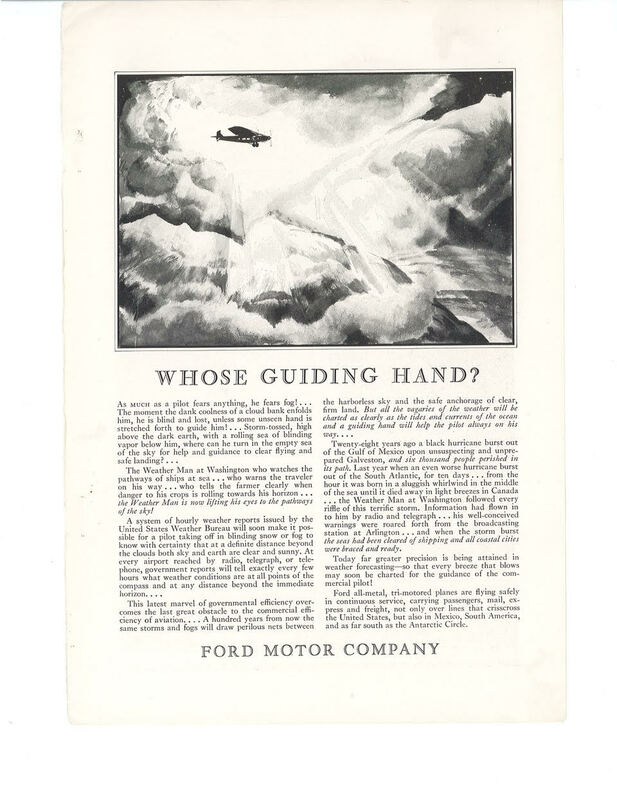 “Whose Guiding Hand?” Advertisement for Ford Motor Company. National Geographic, December 1929. The role of government is a reminder that aviation is more than aircraft. It also includes airports and navigation beacons, government regulators, schools of aeronautical engineering, administrative techniques for managing airlines, and much more. Historians call assemblages like this “technological systems.” Understanding the role of workers in aviation means paying attention to the less noticeable kinds of labor that happen across the system necessary to keep passengers and cargo moving. It may seem curious to connect meteorology with “labor.” Weather work is generally cognitive and administrative. It is not usually physically arduous, like laying bricks for roads, though sometimes observers did exert themselves in difficult environments. But transportation systems require diverse kinds of labor, in the sense of work done by humans. By paying attention to the weather workers, we can see that aviation is more than sleek machines slipping through the air; it’s also a complex collection of humans trying to make a living, using their judgement, and going to work each day as part of a system upon which other people have come to depend. Figure 4. Unnamed Weather Bureau meteorologist at Kennedy Airport, c. 1968. Source: Folder: “Analysis Prediction,” Acquisition 1230-13-68, Photo Archive, NOAA Central Library, Silver Spring Maryland. Rights status: Public domain. The US Weather Bureau collected only a tiny amount of information about the upper air before 1931, mainly using instruments mounted on kites that rarely reached above five thousand feet. Beginning on July 1, 1931, the Weather Bureau commissioned daily flights to record conditions aloft, with simultaneous take-offs at five a.m. eastern time from Chicago, Cleveland, Dallas and Omaha. Private pilots flew their own planes, after Weather Bureau technicians attached aerometeographs to measure temperature, pressure and humidity aloft. Pilots earned twenty-five dollars only if they reached at least 13,500 feet, plus a ten percent bonus for every additional one thousand feet. In cooperation with the military, airplane observations were expanded to twenty-two stations in 1934, and to thirty stations by 1937 (Whitnah 1961: 187-89). Pictured here is Johnny Starr, celebrated as the “Best Flying Weatherman” since he often reached two to three thousand feet higher than other pilots. Starr is wearing a fur-lined flight suit and wool gloves to insulate him from temperatures that could reach forty degrees below zero at high altitude. The resident cat of the Omaha, Nebraska airport greeted him after every flight. 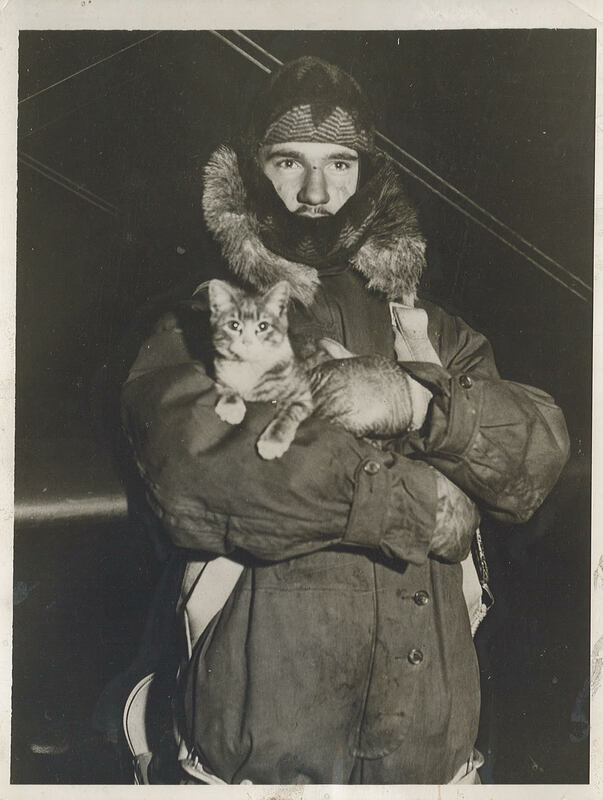 By 1938, when the Weather Bureau required pilots to reach 16,500 feet to be paid, some pilots carried cats, dogs, or even squirrels aloft with them. As oxygen dwindled, the animal’s head would droop, warning the pilot to descend before his judgment was impaired by hypoxia. Twelve pilots were killed making airplane observations between 1931 and 1938. Figure 5. Weather observation pilot Johnny Starr in Omaha, Nebraska, December 17, 1931. Photo by ACME Newspictures. Print in author’s personal collection. The US Weather Bureau switched from using airplanes to radiosondes to collect upper air observations in 1938. These electronic instruments broadcast measurements of temperature, humidity and atmospheric pressure as they ascended at a constant rate. The balloons burst around 70,000 feet, and a small parachute carried the instrument safely to the ground. Though the newspapers called them “robot balloons,” these instruments still required a considerable amount of labor. Filling and launching the hydrogen-filled balloon required a two-man team, while an observer checked the data as they were printed at the receiving station. The observer or other “sub-professional” staff then plotted the data on a skew-T, log-p chart, a kind of thermodynamic diagram with distorted axes that simplified the tedious calculations involved. Interpreting these charts helped forecasters track air masses across the country, since an air mass retained its thermodynamic character as it moved. Radiosondes reduced costs. But upper air observations remained much more expensive to collect than surface observations. There were thirty-four radiosonde stations taking observations once a day in 1940, which was doubled to twice a day as a defense measure just before the United States entered World War II. Radiosondes cost about nine dollars in 1938 (about one hundred and sixty dollars in current funds), affordable enough to be lost, but worth reusing if they could be retrieved. Instruments carried a post-paid address label and a reward was promised if returned to the Weather Bureau. Figure 6. Operating a radiosonde for measuring the upper air. Source: Joseph Gaer, Fair and Warmer (Harcourt Brace, 1939), 101-102. By the late 1930s, every major U.S. airline had a meteorological division. But unlike pilots or flight attendants, meteorologists were not directly visible to the flying public. 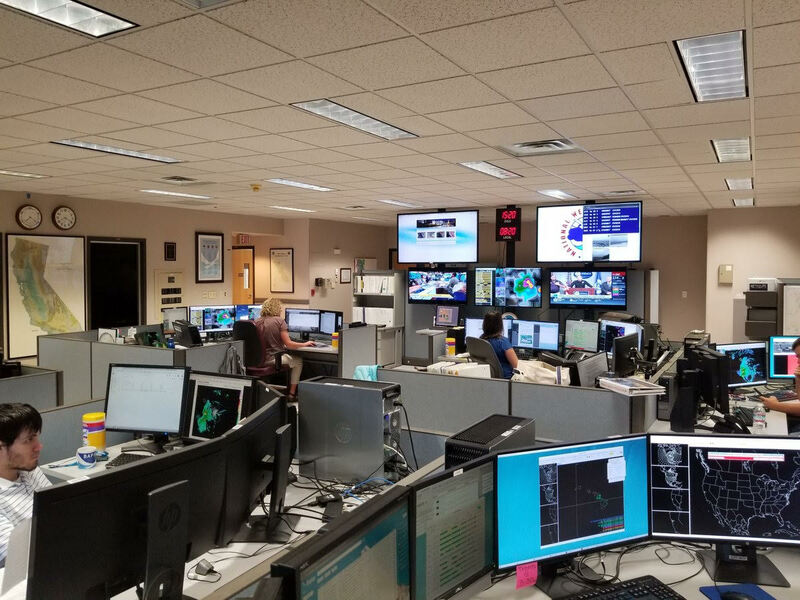 Weather workers were back-stage, part of the operations staff that included dispatchers and traffic managers. Domestic airline meteorologists were largely recruited from the US Weather Bureau or the Army Air Corps (Pan Am monopolized ex-Navy men), or hired directly after graduating from one of the two new graduate programs in meteorology at MIT and Caltech. Small programs at the Boeing School of Aeronautics and Parks Air College also graduated a few airline meteorologists. Airline meteorology was not a large occupation; an informal census counted ninety-four airline meteorologists in July 1940, about one quarter of all the trained weather forecasters in the United States. They typically worked 48-hour weeks and started at two to three hundred dollars a month, with good job security. Next a meteorologist would predict the atmospheric conditions each flight would experience. He (airline meteorologists were all men, until a couple of women were hired during World War II) paid particular attention to fog, areas of significant vertical movement in the air column, headwinds and tailwinds. Also of major concern were patches of air with liquid water that could freeze on contact with an airplane; wing icing diminishes lift and led to many crashes. He then briefed the pilots and dispatchers. When flying conditions were potentially dangerous, the dispatcher, pilot and meteorologist would collaboratively decide whether a plane could take off and its optimum flight levels. The meteorologist was an advisor; ultimate responsibility for flight safety lay with pilots. Forecasts and current weather conditions were printed on clearances and flight plans carried in the cockpit. Meteorologists and pilots both signed these documents to legally acknowledge them. Airline meteorology was primarily focused on safety, as pilots needed minimum visibility distances and adequate cloud ceilings in order to land. Meteorologists could improve efficiency as well, for instance by finding a route longer by statute miles, but faster because of tailwinds. Meteorologists did their best with sparse upper air data during the 1930s, but weather still caused many delays, and worse, fatal crashes. Figure 7. 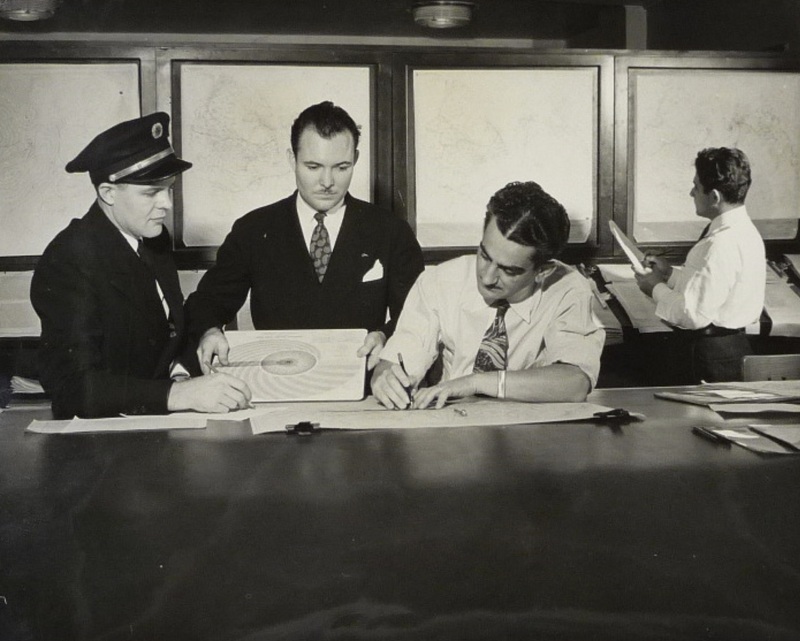 Unnamed Pan Am meteorologist (foreground right) briefs a pilot and dispatcher prior in a staged publicity photograph, c. 1939. Pan Am Airways, Inc. Records, Collection 341, Series I, Box 41 Folder 23, “Meteorology Brochures.” Courtesy of Special Collections, University of Miami Libraries, Coral Gables, Florida. The vast expansion of military aviation to fight World War II demanded weather observers and forecasters. United States training programs produced more than six thousand new weather forecasters, up from just four hundred forecasters in the United States in 1940. More than ten thousand military weather observers were trained as well. The profusion of air bases and weather stations around the world also increased the collection of weather data, leading to advances in meteorological theory and forecast accuracy. While aviation meteorology had been uniformly male before the war, World War II created new opportunities for many women. Several hundred women served as observers, while about one hundred went through college level programs preparing them for professional roles in meteorology. Recruitment policies required these women to have master’s degrees in science prior to starting training, thus making them better qualified than most of the male trainees. Military rules prohibited these women from being deployed overseas. Some forecast for squadrons of submarine-hunting blimps and pilot training bases, though most worked as instructors and meteorology researchers. Most of these women were pushed out of professional roles in meteorology after the war, though some women stayed on as observers and map plotters. Exceptions included Florence Van Straten, a researcher for the U.S. Navy, and Joanne Simpson, who became the first woman to receive a Ph.D. in meteorology in the United States in 1949. Figure 8. 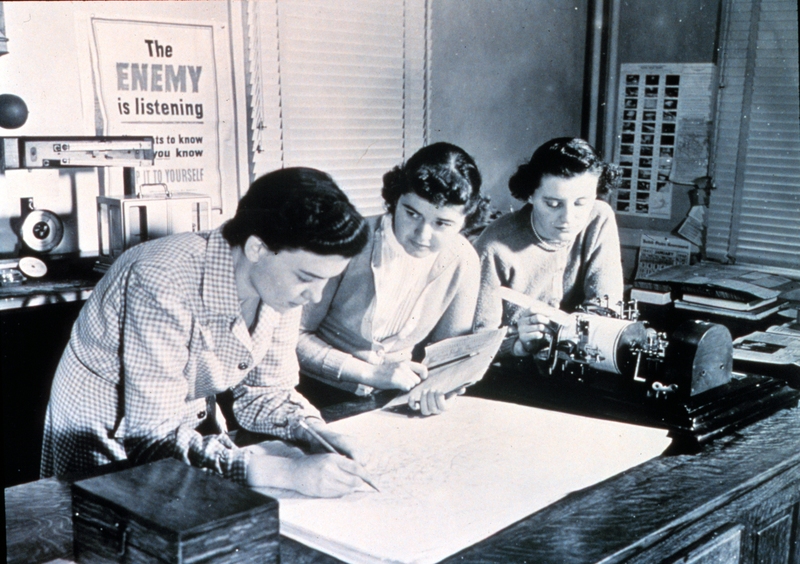 Unidentified women plot an upper air chart, c. 1944. NOAA Photo Library. Rights status: Public domain. After World War II, airlines sought to rebuild their commercial traffic by convincing potential passengers that flight was safe and comfortable. Meteorologists were among the experts featured in advertisements. 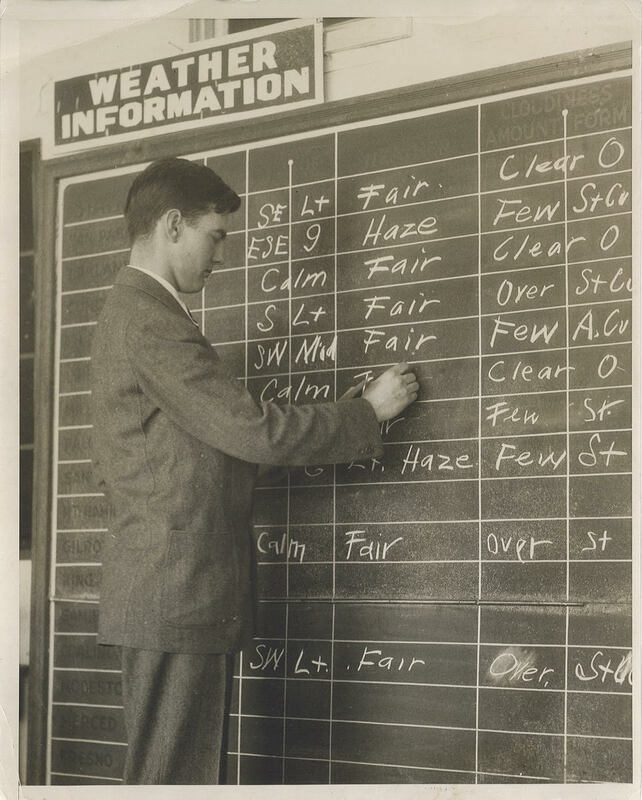 Continuing a pre-war trend, the preflight weather briefing was probably the most common situation in which airline meteorologists were depicted. Photographs of this moment were published in popular books describing air travel and promotional brochures. 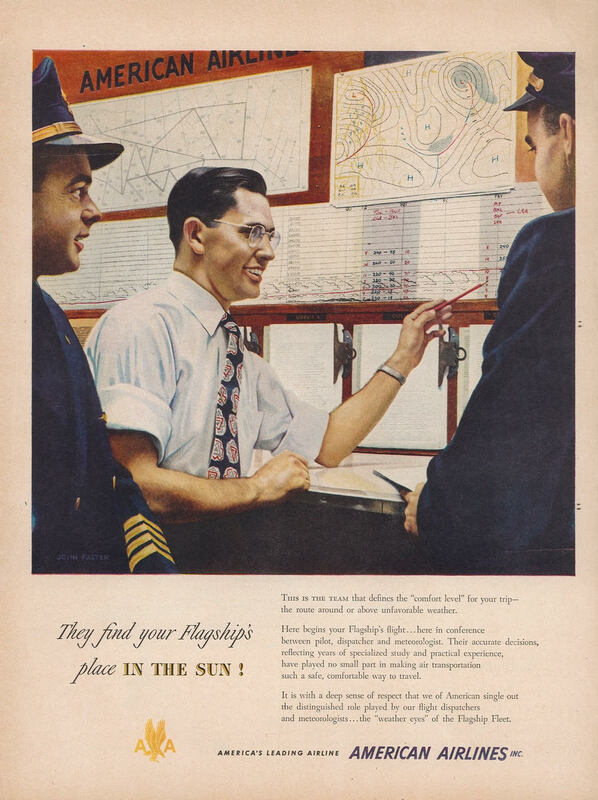 This 1950 advertisement for American Airlines touted the meteorologists and flight dispatchers who served as the “weather eyes” of the airline. “This is the team that defines the ‘comfort level’ for your trip—the route around or above unfavorable weather,” American claimed. A United Airlines ad from 1962 advised readers to carry an umbrella whenever an airline meteorologist did, since he was never wrong. These claims were mostly puffery, of course. While airline meteorology departments were hard at work, they had a far from complete view of what was going on in the atmosphere. Observations made by the Weather Bureau were supplemented by “pireps,” the inflight reports made by pilots that were radioed back to airport towers and then transmitted to forecast stations. Figure 9. “They Find Your Flagship’s Place in the Sun!” Advertisement for American Airlines, probably published in Life Magazine, 1950. From a copy in author’s personal collection. Aviation meteorologists invented the TV weather report in the decade immediately after World War II, transforming how Americans learned about daily weather. Men like US Air Force officer and American Airlines meteorologist Harold Taft presented weather reports and forecasts on local TV stations across the country. “We thought it would be a good idea to use the briefing techniques that we used for pilots during the war for television,” he remembered later. They combined the briefing’s narrative form with a simplified synoptic map, sometimes drawn live on camera to add additional visual interest. Emulating the success of ex-Navy forecaster Louis Allen in Washington D.C., several meteorologists sketched cartoons on screen to give away to viewers. From about 1948 until 1952, military veterans represented meteorology from nationally prominent cities like New York to smaller regional centers like Tulsa and New Orleans. The Federal Communications Commission lifted its freeze on new stations in 1952, stimulating new experiments in presenting the weather. Some stations dispensed with meteorological experience and hired personable cartoonists. Others sought ratings by hiring “weather girls,” generally young actresses, beauty queens, or models. The American Meteorological Society responded by creating a “Seal of Approval” available only to experienced meteorologists who presented the weather with a suitably “professional” persona, as judged by an all-male board. Ninety-five men received the seal before the first woman was granted a seal in 1972 (Turner 2009). But the Seal of Approval never succeeded in securing TV weather reports exclusively for educated, experienced meteorologists (Henson 2010). TV “weathercasters” became local celebrities, visiting schools and engaging in public outreach more than any other group of meteorologists. While broadcasters acknowledged the Weather Bureau as a source of observational data and forecasting guidance, TV weathercasters had become the public face of meteorology by the 1960s. Figure 10. Harold Taft presents a television weather report, 1954. Image printed in the Fort Worth Star-Telegram, Sept 29, 1991, Section E, page 8. Scanned and posted online at http://hometownbyhandlebar.com/?p=18416. Beginning in the 1950s, pressurized planes powered by jet engines shifted the weather problems confronting airlines. Jets like the British Comet and the American 707 and DC-8 cruised in the stratosphere. Airlines and jet manufacturers liked to claim they flew “above the weather,” but tropospheric conditions remained important during take-off and landing, and for shorter-range feeder aircraft that delivered passengers to airline hubs. And jets introduced new weather problems. Much higher landing speeds made jets vulnerable to overrunning wet runways. Clear air turbulence reached into the stratosphere, leading to injuries when passengers took off their seatbelts during cruise. Fine volcanic ash, invisible to the naked eye, could fuse to hot turbine blades and disable engines, sometimes all four at once. After ash nearly brought down a 747 in 1982, and then another in 1989, the International Civil Aviation Organization worked with national weather services to establish nine Volcanic Ash Advisory Centers to track eruptions around the world. Radars mounted in planes gave pilots a new tool for seeing the weather immediately ahead. United Airlines began to experiment with airborne weather radar in 1953, mounting a set in a DC-3 that was soon nicknamed “Sir Echo.” While valuable, pilots and first officers had to learn to recognize weather conditions in the reflections on their scopes (Harrison 1954). Figure 11. Boeing claimed its new jetliner flew “above the weather.” Advertisement for a Boeing 707. Scanned from a copy in author’s personal collection. By the end of the twentieth century, weather services collected vastly more data about all levels of the atmosphere. This data came from automated versions of long-established instruments like barometers, thermometers and hygrometers, plus new instruments including radar, lidar, and satellite-based remote sensing. Computers mediated the flow of these observations to initialize the numerical models used for forecasting (Edwards 2010). While skillful weather forecasting retains a crucial human element, automation and computerization have transformed the kinds of labor done by meteorological workers (Fine 2007). The new nature of meteorological data changed the working conditions of meteorologists. 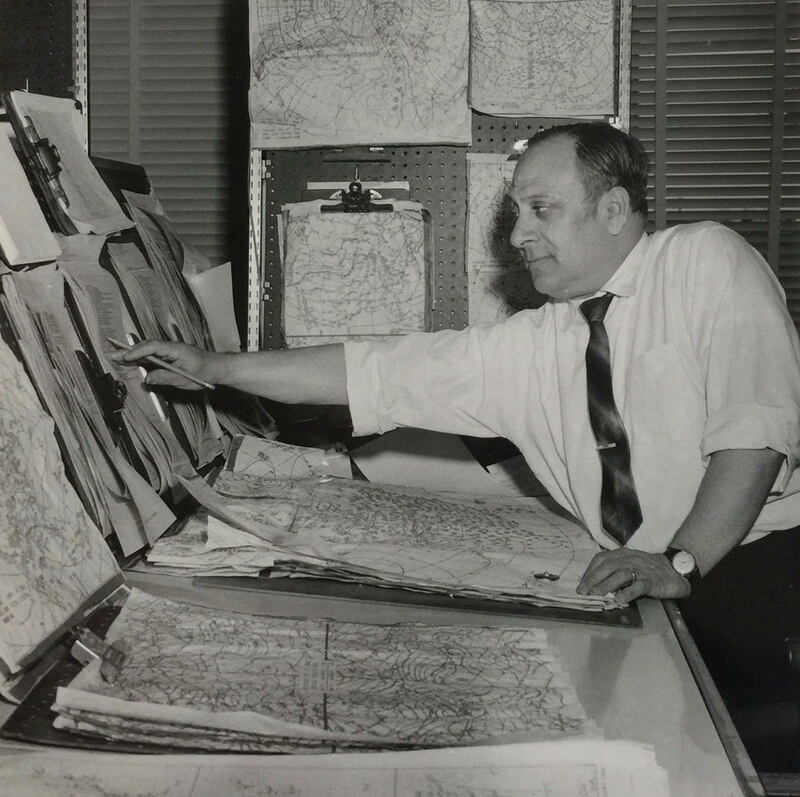 As this information was gradually integrated digitally, meteorologists increasingly worked in windowless spaces surrounded by screens, rather than racks of paper maps. Telecommunications advances and efforts to cut costs meant that in-person weather briefings were disappearing by the early 1970s, replaced by phone calls from pilots to forecasters in a central office, or even by “self-briefings,” where pilots read the weather situation for themselves, from synoptic charts and route forecasts distributed via facsimile to each originating airport. Meteorologists thus became less visible even to the transport workers who continue to depend upon their work and expertise. Meteorologists rarely if ever appear in airline advertisements today, as airlines compete on price and convenience, not safety or comfort. While weather work remains essential to the infrastructure of air transportation, it has receded deep into the cultural background. Figure 12. Computer screens dominate the workspace of the National Weather Service’s San Francisco Bay Area office, August 2018. Source: National Weather Service San Francisco Bay Area office, via Twitter. Figure 13. 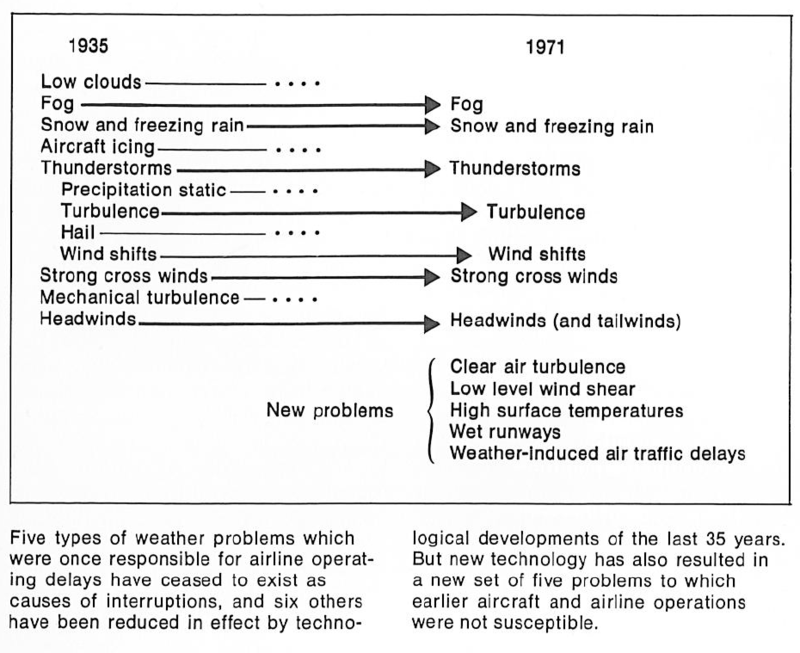 Changes and continuities in airline weather problems between 1935 and 1971. W. Boynton Beckwith, “Airline Meteorology Today,” Technology Review (February 1972): 12. Erik M. Conway, Blind Landings: Low-Visibility Operations in American Aviation, 1918–1958 (Johns Hopkins University Press, 2006). Gary Alan Fine, Authors of the Storm: Meteorologists and the Culture of Prediction (University of Chicago Press, 2007). James Rodger Fleming, Inventing Atmospheric Science: Bjerknes, Rossby, Wexler and the Foundations of Modern Meteorology (MIT Press, 2016). John F. Fuller, Thor’s Legions: Weather Support to the US Air Force and Army, 1937-1987 (American Meteorological Society, 1990). Henry T. Harrison, “Highlights of United Air Lines Weather Radar Evaluation,” Weatherwise v. 7 n. 4 (1954): 92-95. Matthew Henry, “Assembling the Weather: Expertise, Authority and the Negotiation of trans-Tasman Aviation Forecasts,” History of Meteorology 8 (2017): 179-201. Robert Henson, Weather on the Air: A History of Broadcast Meteorology (American Meteorological Society, 2010). Matthew H. Hersch, Inventing the American Astronaut (Palgrave Macmillan, 2012). Tom Morrison, Quest for All Weather Flight (Crowood, 2003). Morley Thomas, Forecasts for Flying: Meteorology in Canada, 1918-1939 (ECW Press, 1996). Roger Turner, “Teaching the Weather Cadet Generation: Aviation, Pedagogy, and Aspirations to a Universal Meteorology in America, 1920-1950,” in Intimate Universality: Local and Global Themes in the History of Weather and Climate, edited by James R. Fleming, Vladimir Jankovic, and Deborah R. Coen (Science History Publications, 2006): 141-173. Roger Turner, “Keeping Meteorology Masculine: The American Meteorological Society’s Response to TV ‘Weather Girls’ in the 1950s,” in Weather, Local Knowledge and Everyday Life: Issues in Integrated Climate Studies, edited by Vladimir Jankovic and Christina Barboza (Rio de Janeiro: MAST, 2009): 147-158. Roger Turner, “Weathering Heights: The Emergence of Aeronautical Meteorology as an Infrastructural Science,” Ph.D. Dissertation (University of Pennsylvania, 2010). Malcolm Walker, History of the Meteorological Office (Cambridge University Press, 2012). Donald R. Whitnah, A History of the United States Weather Bureau (University of Illinois Press, 1961). Kenneth A. Willard, “So you want to be an Airline Meteorologist?” Flying Magazine (May 1939): 38-41. Kathleen Williams. Improbable Warriors: Women Scientists and the U.S. Navy in World War II (Naval Institute Press, 2001). Roger Turner is a research fellow and public historian at the Science History Institute in Philadelphia. His research interests include the use of environmental surveillance and prediction in industrial societies, and how story-telling can engage various publics in scientific, technological, and environmental issues. He curates the blog Picturing Meteorology and recently completed work on Instruments of Change, a playful multimedia exhibit about five surprising scientific instruments.